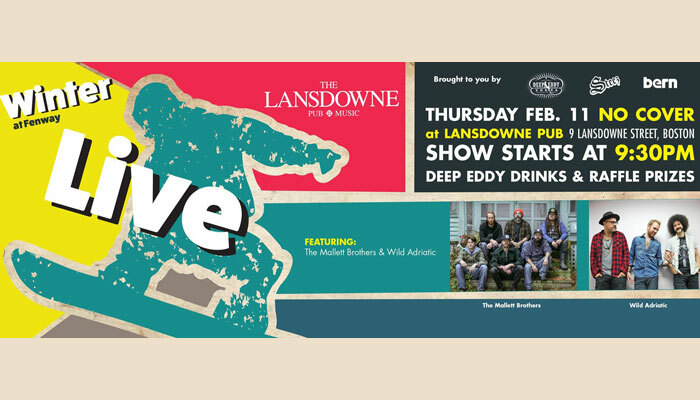 Come party with us after the Big Air at Fenway this Thursday night at The Lansdowne Pub. The no cover, tons of drink specials, live music and prizes. Check The Facebook event page for more details. Snow fills Fremont Street from Las Vegas Boulevard to 6th Street on January 23 for the second annual Park Jam snowboard competition. For you Vegas natives, snow is frozen water vapor that forms white ice crystal flakes. It’s cold. 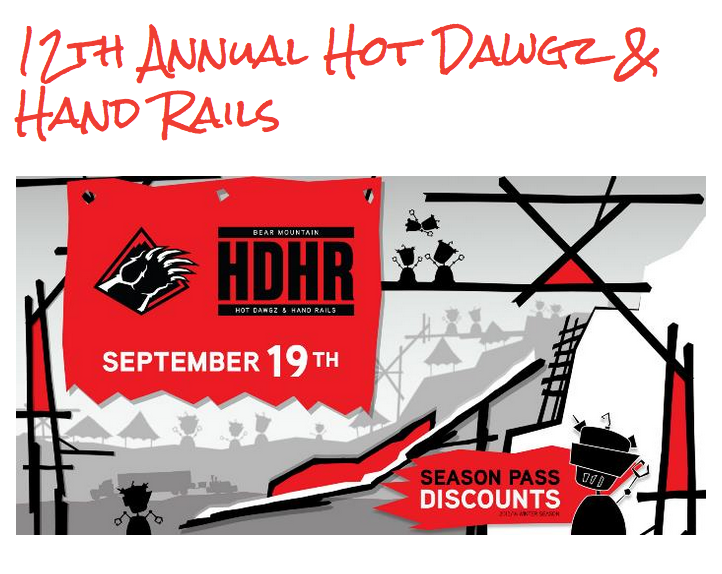 Anyway, 25 riders will be judged on the best trick they can pull off in 45 minutes on a massive 30-foot tall rail structure. The winner snags $5,000. Last year’s winner, Matt Schaefer, will return to defend his title. 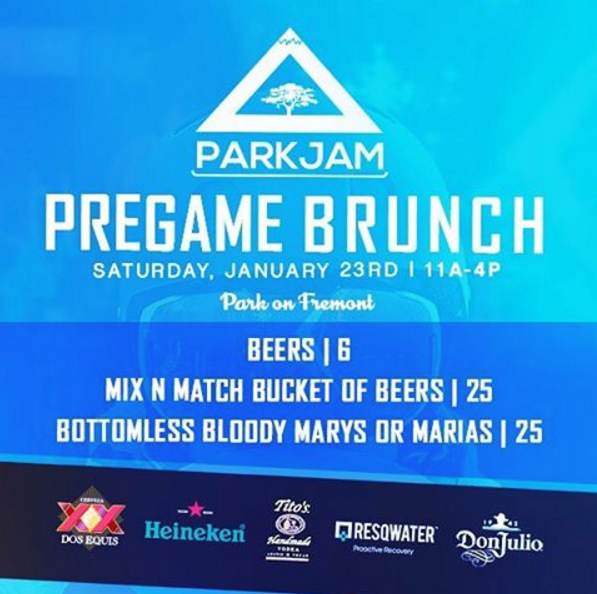 The free event, sponsored by Zappos and Vegas Seven, starts with a pre-game brunch available from 11a.m. to 4 p.m. at Park on Fremont. 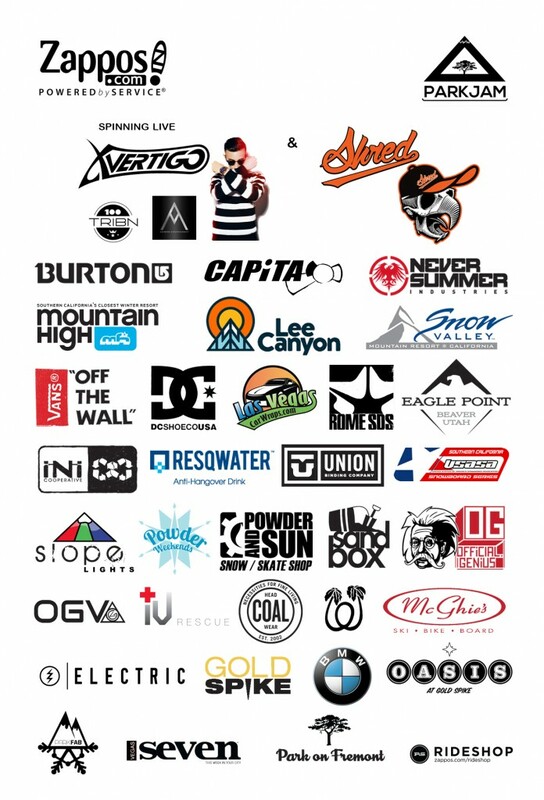 Find snowboard vendors such as Vans and Burton in the Vendor Village, along with a taco truck, a beer garden, and and live DJs. A practice set with rider introduction starts at 6 p.m. before the competition begins at 7:30 p.m.
Parkfab x Official Genius Afterparty — 10pm at Goldspike! 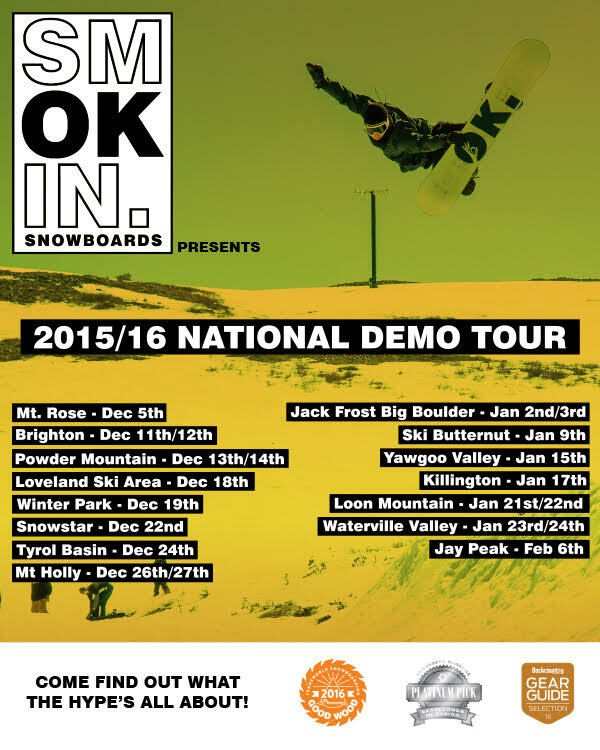 Burton recently announced the 2016 Burton Mountain Festival, an on-snow demo tour offering an elevated snowboarding experience at eight resorts around the country. 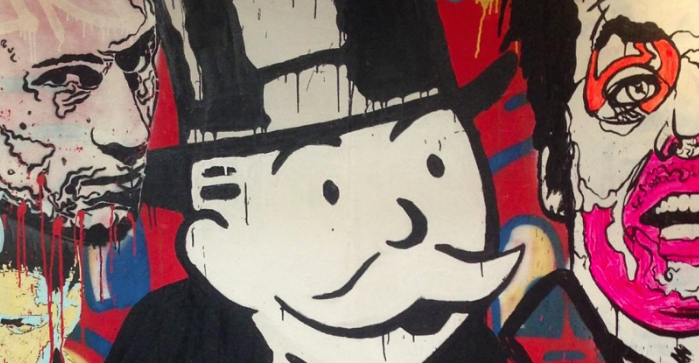 This year’s Burton Mountain Festival offers free Burton Snowboards hardgood demos, Anon. helmet and goggle demos, a Riglet Park for kids, women’s ride days presented by BurtonGirls.com, an interactive sponsor village and more. At all stops, Burton warmly welcomes the ladies to the Burton Girls demo tent to talk one-on-one with female staff and find the perfect custom hardgoods package. This is the ideal opportunity to learn more about women’s-specific products, made for women by women, and then try it all out for free. The Burton Mountain Festival will also feature Girls Ride Days at select locations, so be sure to visit BurtonGirls.com for a complete list of Burton Girls Ride Days. There’s also something for the whole family at the Burton Mountain Festival too, including free youth demos and learn to ride opportunities. Even the smallest kids can expect to find Burton snowboards, boots and bindings, as well as the Riglet Reel, a specially designed reel attached to the nose of youth snowboards that makes learning to ride easier than ever. Kids as young as three-years-old will have the opportunity to experience snowboarding for the first time in the one-and-only Riglet Park, as well as try out the boxes, ramps and rails with certified snowboard instructors on hand. 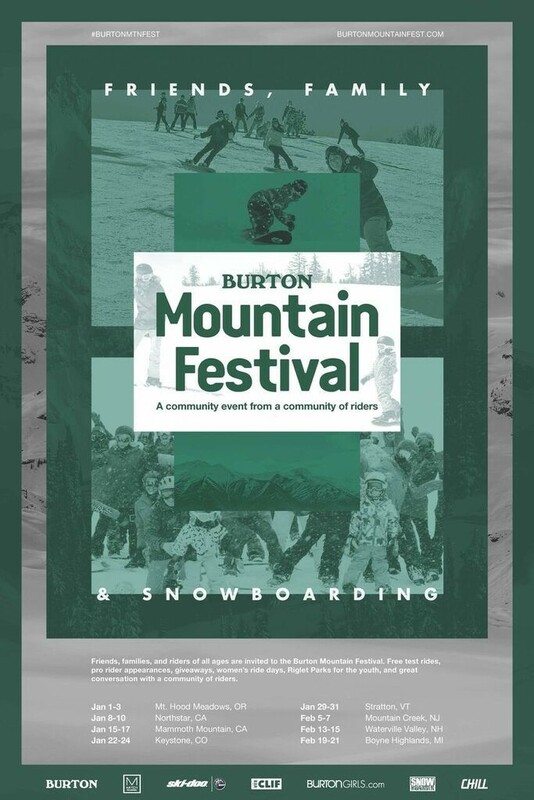 For more information, please visit BurtonMountainFest.com. For more information, please visit http://smokinsnowboards.com. PowderJet Snowboards have announced that they’re bringing their popular “Build Your Own Snowboard” workshops to four locations across the country in February of 2016. 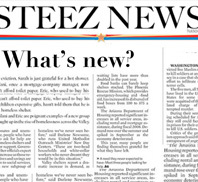 Workshops will take place in Steamboat Springs, CO; Jackson Hole, WY; Salt Lake City, UT; and Encinitas, CA. Class participants will spend two days designing, shaping, and building a custom snowboard under the direction of PowderJet founder Jesse Loomis. Once the weekend is over, participants will have a one of a kind wooden snowboard with a Ptex base and steel edges that’s ready to shred. Participants will also receive a limited edition t-shirt and print, designed by artist/team rider Scott Lenhardt. Space is limited. 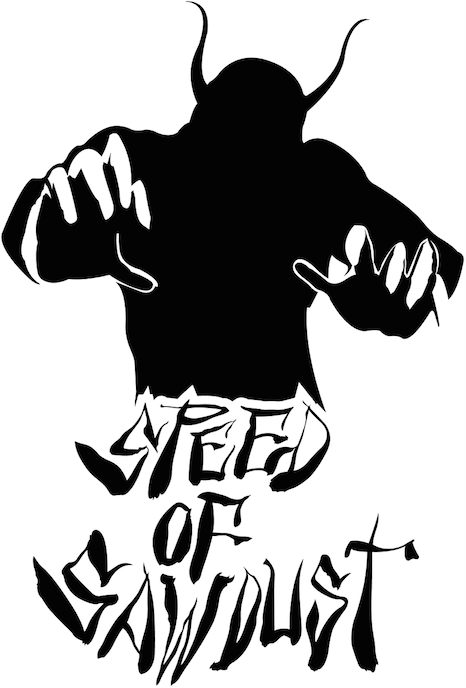 For more details and to sign up, please visit powderjets.com/speed-of-sawdust. Founded in Vermont in 2009, PowderJet Snowboards builds wooden powder boards on a custom basis. Their boards are hand-built from start to finish, and are designed for backcountry and powder riding. 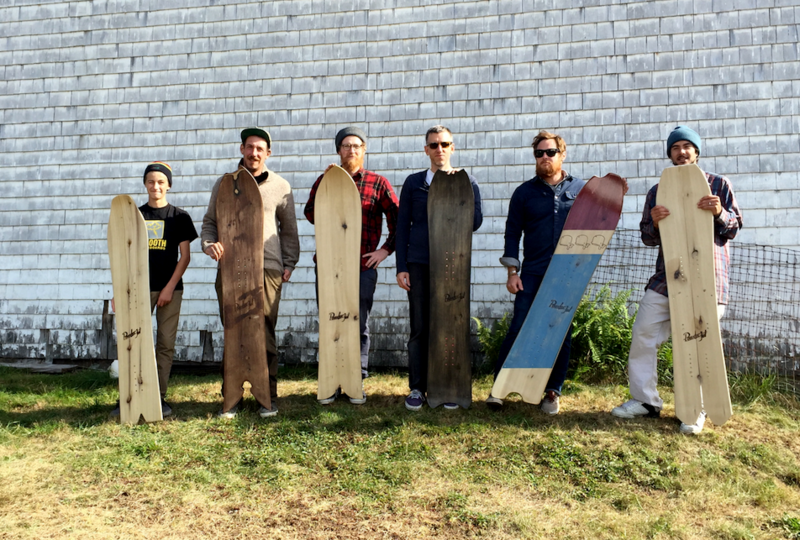 In 2014, PowderJet became the first snowboard company to offer board building classes, teaching workshops at the shop they share with Grain Surfboards on the Maine coast. 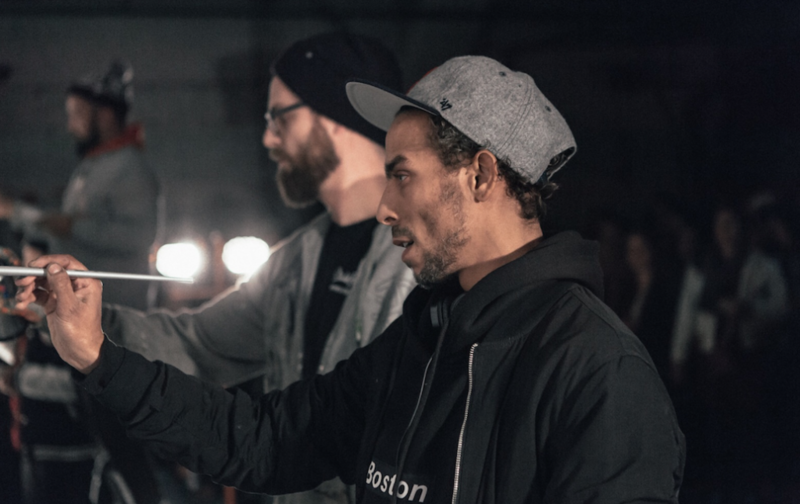 On Thursday, November 19th, Boston-based sports lifestyle brand ’47 hosted ‘Secret Walls’, an underground, Fight Club-inspired live-art battle between graffiti artists at Fenway Park. 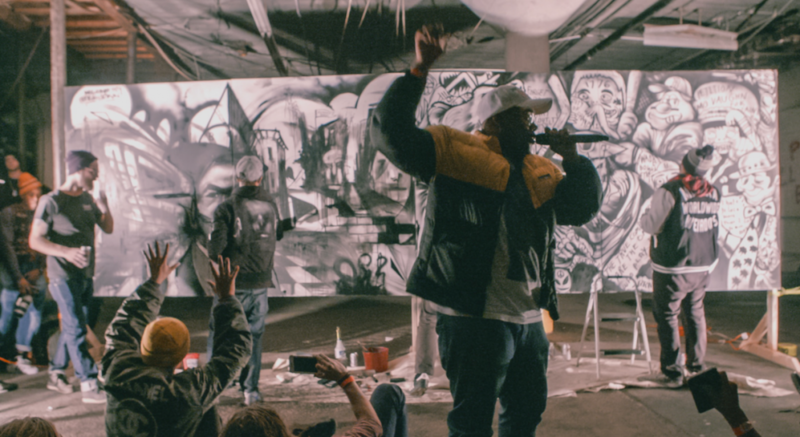 Tucked inside a private garage at the corner of Yawkey Way and Arthur’s Way, two separate art crews participated in a 90-minute live art battle as local supporters cheered on. 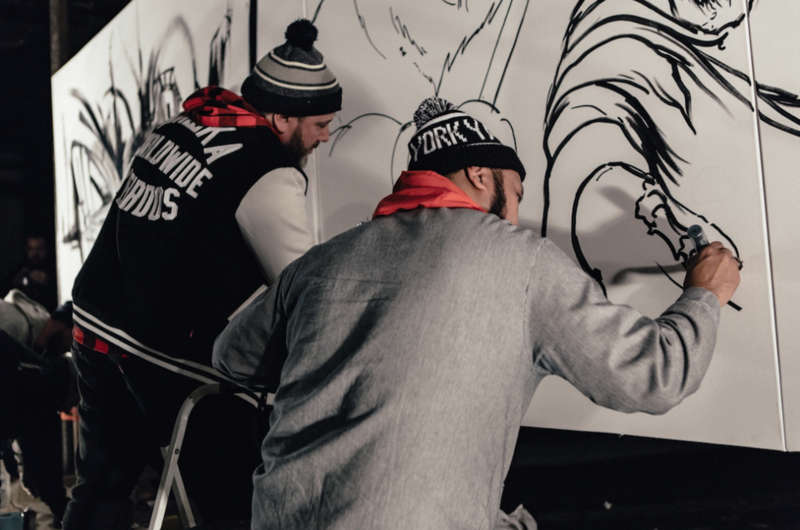 Boston artists Dan Woulfe and Percy Fortini-Wright of Studio Fresh took on NYC artists Greg Mishka and L’Amour Suprim of Monorex, with New York ultimately taking the crown at the end of the night. 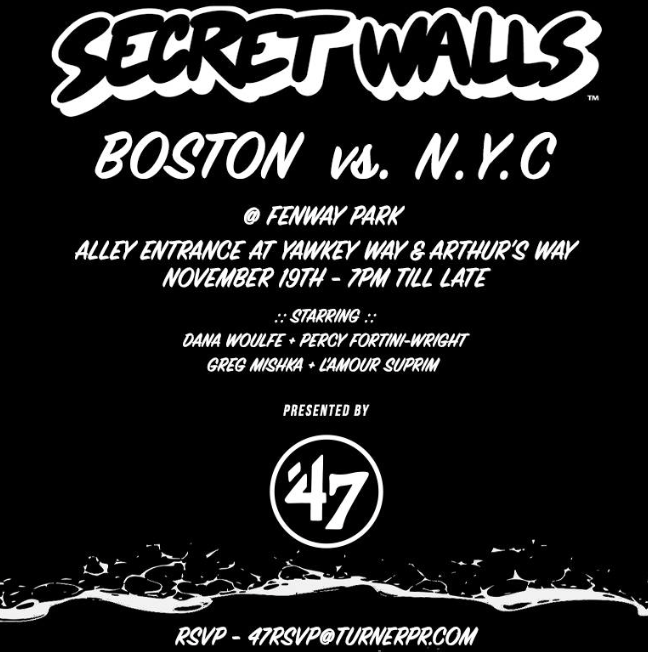 Sport lifestyle brand, ’47, is bringing Secret Walls, a premier live art battle, to Boston. 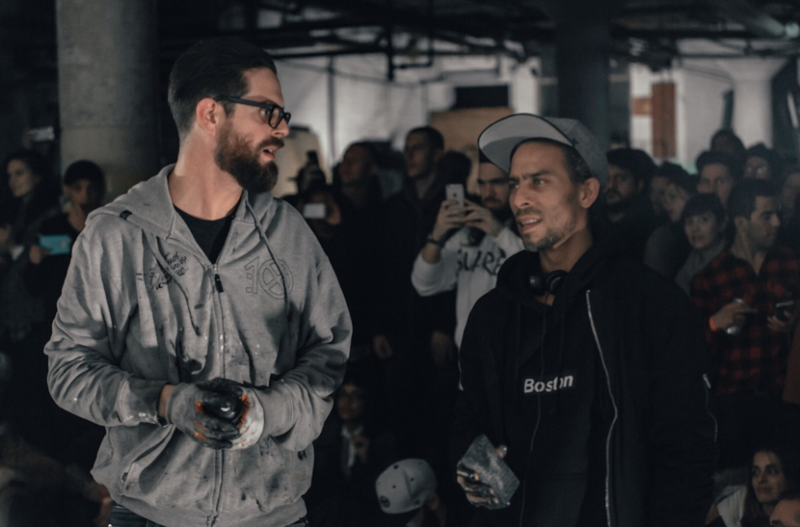 The event will play off of the long-standing New York vs. Boston rivalry, and artists from the Boston area will go head-to-head with New York artists. Boston artists, Dana Woulfe and Percy Fortini-Wright will ‘battle’ New York’s Greg Mishka and L’Amour Suprim outside Fenway Park in the alley entrance of Yawkey Way and Aurther’s Way. Local food trucks will be on-site and free beer will be served as well. 21+ only, RSVP required. Please e-mail “47RSVP@turnerpr.com” to do so. For more info on ’47, visit http://www.47brand.com. Tickets are $15 and children 12 and under are free. Available online or at the door. 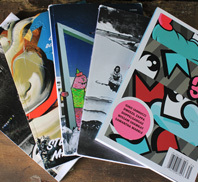 Purchase includes one year magazine subscription to SKI or Skiing and a $10 Liftopia Gift Card. For more information visit http://www.bewisports.com/expos/boston/. 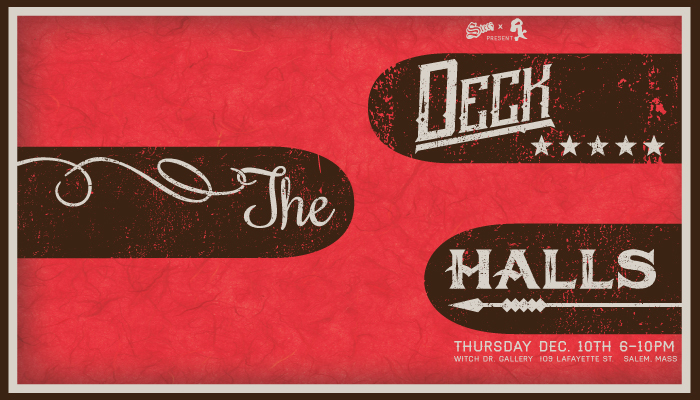 Deck The Halls is a skate deck art show brought to you by Witch Dr. and Steez. 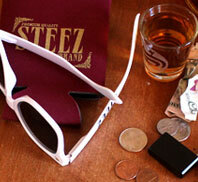 We have 100 blank decks we’ll be selling in the coming month at both Steez HQ and Witch Dr. for $25. Get yours before they’re gone. Artists will have until Dec. 5th to do whatever they want with the deck and return them to Witch Dr. A huge art show will then take place at the new Witch Dr. Gallery on Dec. 10th with live music, free food and drinks. 80% of all sales will go directly back to the artists, with the other 20% going towards x-mas toys for unprivelged local kids to have an awesome x-mas. It’s a win-win for everyone and will be a ton of fun. Help spread the word! 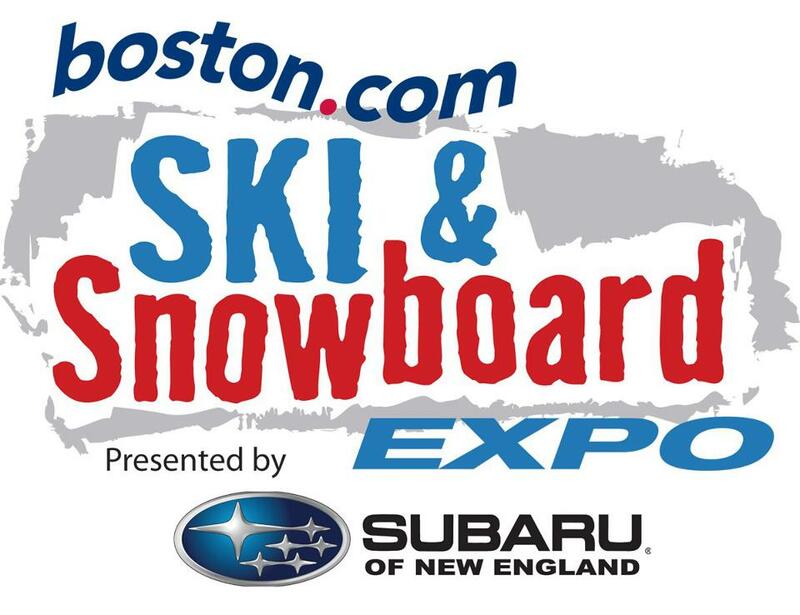 From Saturday, Oct. 10th to Saturday, Oct. 17th, the Coolidge Corner Theatre, The Greatest Bar, and IMAX Theatre at the New England Aquarium will host Boston’s fourth annual ski, snowboard and outdoor film festival. This five-night festival includes award-winning films from Teton Gravity Research, Level 1 Productions, Chino Surfboards from Boston’s Chinatown and more. The festival opens with a midnight movie night at the Coolidge Corner Theatre hosted by SPY Optics and SnowRiders, followed by three week-nights of films at The Greatest Bar, and a closing Saturday at the IMAX Theatre at the aquarium. The first 1000 guests to buy tickets will receive a 2for1 lift ticket to Sunday River. Attendees will celebrate the films and socialize alongside fellow outdoor enthusiasts as well as starring athletes. Sponsors including Bern Unlimited, SPY, Sunday River Resort, Killington Resort, Deep Eddy Vodka, and SnowRiders will provide crowd giveaways at every movie. 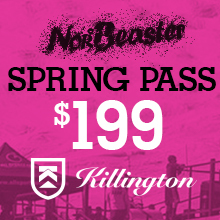 VIP pass holders will receive 2-for-1 lift ticket vouchers to Sunday River and Killington Resorts, exclusive gifts from SPY, SnowRiders and more, access to exclusive parties, complimentary drinks, as well as priority seating and speedy admission. 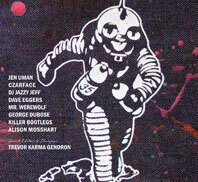 Saturday Oct. 10 at 11:00 pm. Coolidge Corner Theatre. 290 Harvard Street, Brookline, MA 02446. Wednesday Oct. 14 through Friday Oct. 16 at 7:30 pm. The Greatest Bar. 262 Friend Street, Boston, MA 02114. Saturday Oct. 17 at 7:30 pm. Simons IMAX Theatre, New England Aquarium. 1 Central Wharf, Boston, MA 02110. Festival pass prices starting at $20.00. 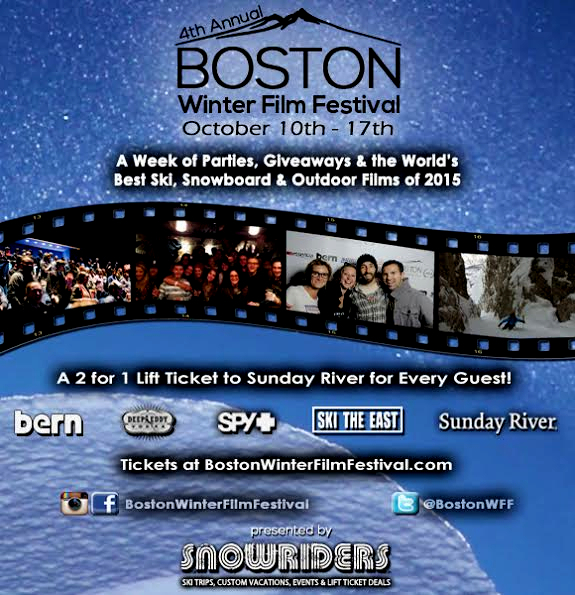 Tickets can be purchased at www.BostonWinterFilmFestival.com. 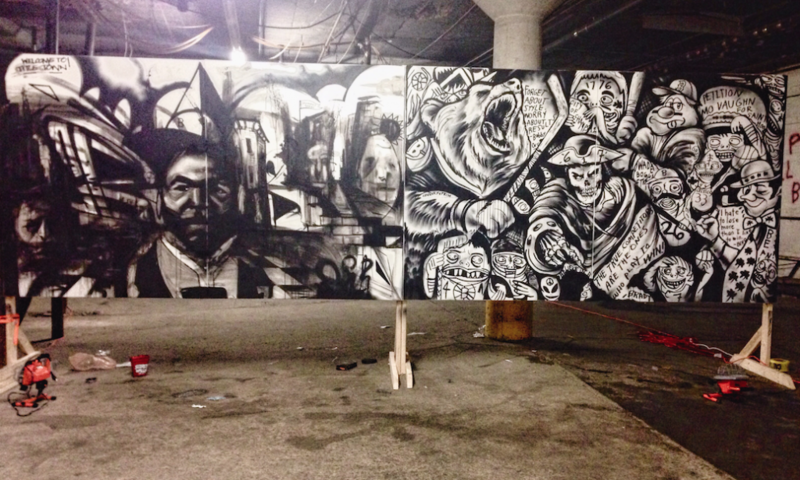 Street Art Fair International presents ‘Street,’ the first-ever global street art fair commencing with its first edition in Los Angeles at Siren Studios Hollywood in October. Street will host a series of events for Platinum and VIP Cardholders, including private performances, and exclusive parties. Street opens on Thursday October 1st with the private preview. The goal of Street to provide a venue for creators of quality fine art and fine craft to meet with the art-buying public. 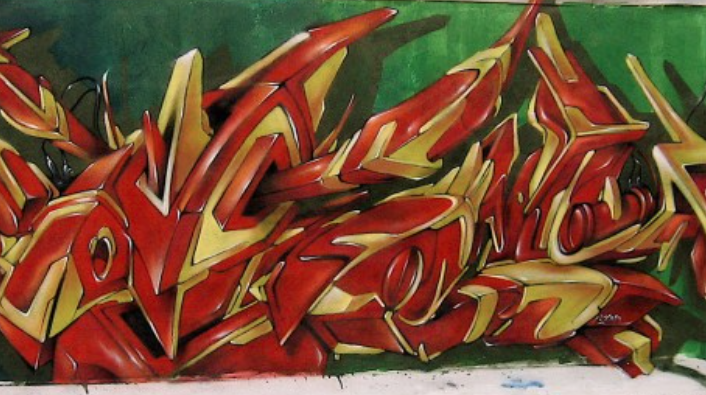 The massive public exhibition will celebrate graffiti and street art’s global movement from October 1st through October 4th at 750 N. San Vicente Blvd. West Hollywood CA 90069. Attracting leading collectors, curators, influencers and critics from across the globe; the three-day outdoor event will commence with a private preview for press, VIP, celebrities, curators and the artists on Thursday, October 1st. Following L.A.’s premiere ‘Street’ edition, the fair will travel internationally, popping up in major cities where the street art movement is alive. For more information, contact Casey Napolitano at 818.404.5090 or casey@minxsociety.com. Photos courtesy of Monopoly and Dytch66. 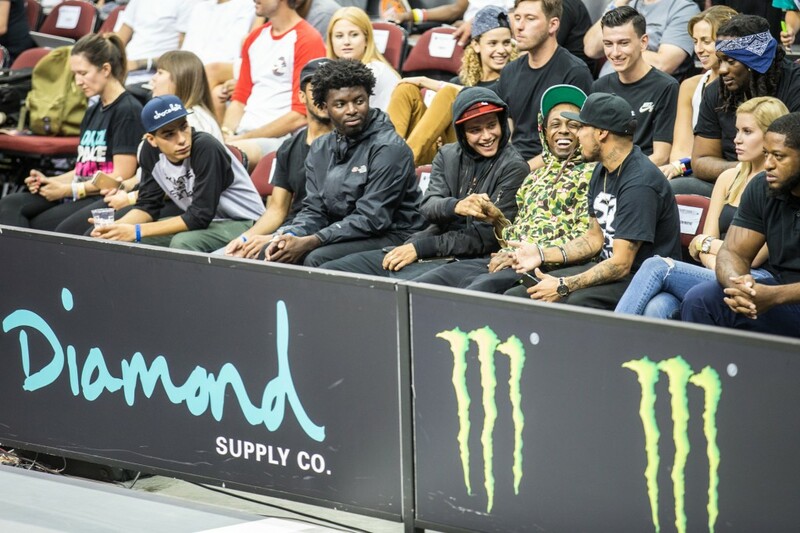 NEW YORK, NY – Harold Hunter Day IX is presented by DC Shoes and the Harold Hunter Foundation, in association with supporting sponsors Zoo York, G-Shock and Skullcandy. 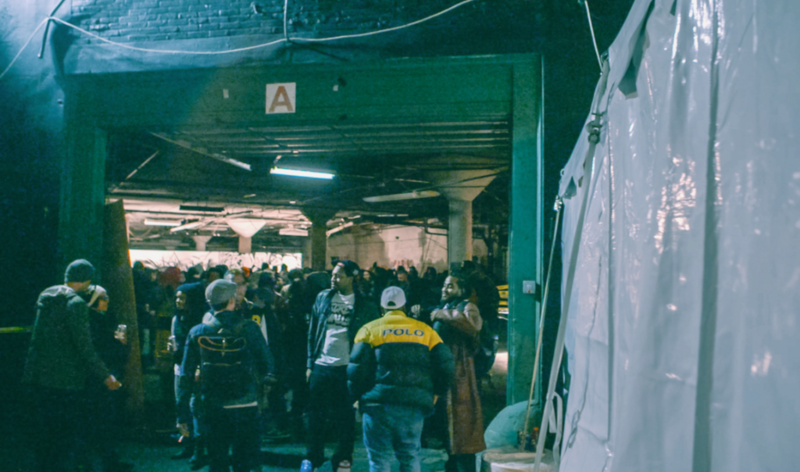 The ninth annual event will take place Sunday, October 4th, from Noon-6:30pm at New York City’s Coleman Oval/LES Skatepark located under the Manhattan Bridge on the corner of Pike Street and Monroe Street. Established in 2006 after Harold’s untimely passing, and managed by the non-profit Harold Hunter Foundation (HHF), Harold Hunter Day IX will once again unite NYC’s tight-knit skate community for a positive, fun-filled day of skateboarding in memory of Harold. HH Day celebrates everything Harold cherished most—skateboarding, music, friends, family, and of course, New York City. This year’s event will be hosted by skate industry veterans and HHF board members Jefferson Pang and Steve Rodriguez. Live music will be provided by acclaimed DJ, producer and lifelong skateboarder, TJ Mizell; son of the late, great Jam Master Jay of Run DMC. As is the case every year, Harold Hunter Day IX will feature an all-ages skate jam with appearances by numerous top pros including DC team riders Evan Smith, Wes Kremer, Cyril Jackson, Tristan Funkhouser, among others. Throughout the day, a variety of Best Trick Contests will be held on various skatepark obstacles with cash and prizes generously provided by DC Shoes, Zoo York and G-Shock. 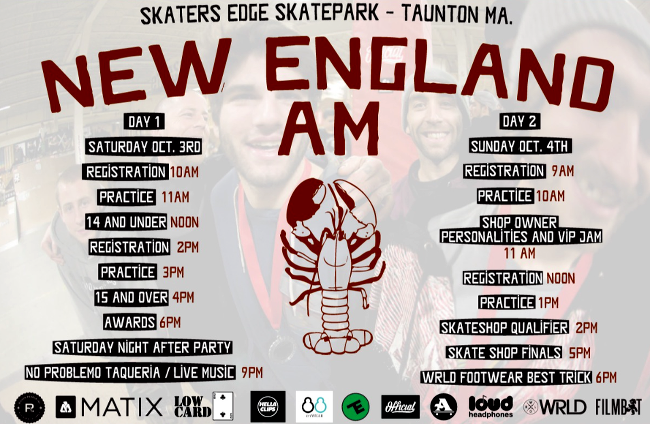 At the conclusion of HH Day, a massive product toss will take place featuring free skateboard decks, t-shirts, hats, stickers, and more from event sponsors. Restaurant “Sweet Chick” will release several special edition menu items in Harold’s memory with a portion of proceeds donated to the Harold Hunter Foundation. They will be available October 2nd-18th at the Sweet Chick locations in the LES (178 Ludlow Street) and Williamsburg (164 Bedford Avenue). Skullcandy, a longtime supporter of Harold Hunter Day, is also planning to release a limited edition, co-branded Harold Hunter Foundation portable Bluetooth speaker to commemorate this year’s event. Slated to drop later this fall, a portion of proceeds will be donated to the foundation. As a registered 501(c)(3) non-profit organization, the Harold Hunter Foundation relies on financial support from the skate community and related outlets to achieve its mission of using skateboarding as a vehicle to provide inner-city youth with valuable life experiences that nurture individual creativity, resourcefulness and the development of life skills. 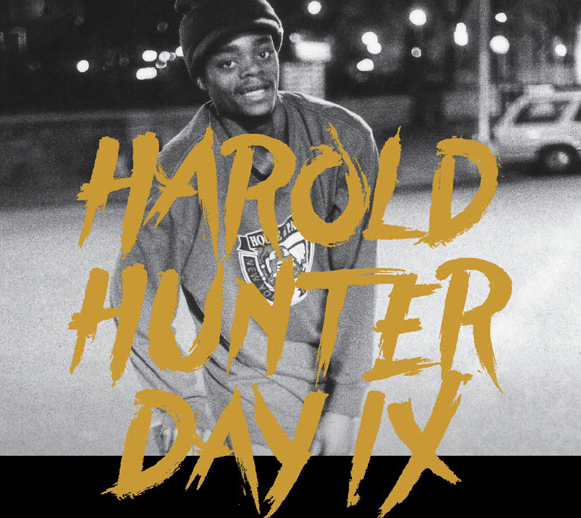 In an effort to raise much needed funds for Harold’s namesake foundation, several charitable projects will coincide with Harold Hunter Day IX. For more information on Harold Hunter Day IX, please visit www.haroldhunter.org. Join us for the biggest winter kickoff party of the year. Gates open at 10:00am with the first heat beginning at 2:00pm. Guest judges include Snowboard Legend Dave Downing, Bear Team Riders Joe Sexton and Chris Bradshaw, plus Austen Sweetin and Stevie Bell. There will be food, music and vendor giveaways for everyone as we welcome in El Nino. Also for one day only, Big Bear Sports will be hosting an HDHR blowout tent sale. 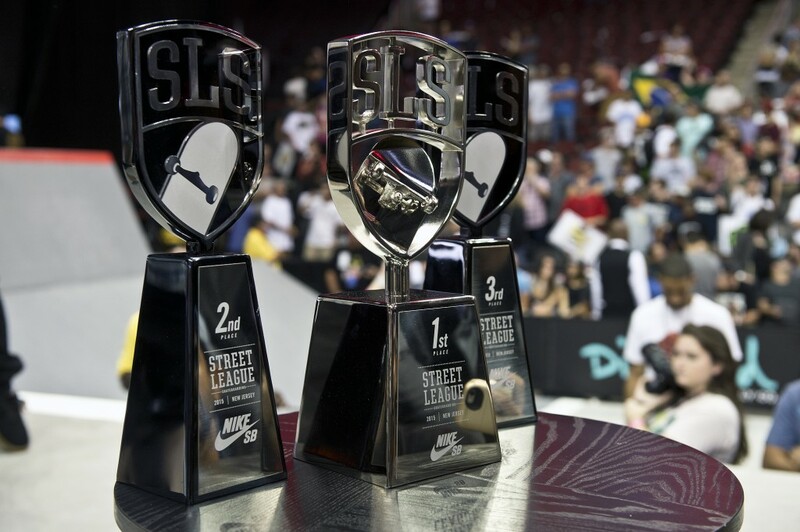 2015 Street League Skateboarding (SLS) Nike SB World Tour continued this weekend at Prudential Center in Newark, NJ, with the full line-up of all 25 SLS Pro skateboarders giving it everything for their last opportunity to make it to the coming SLS Nike SB Super Crown World Championship. 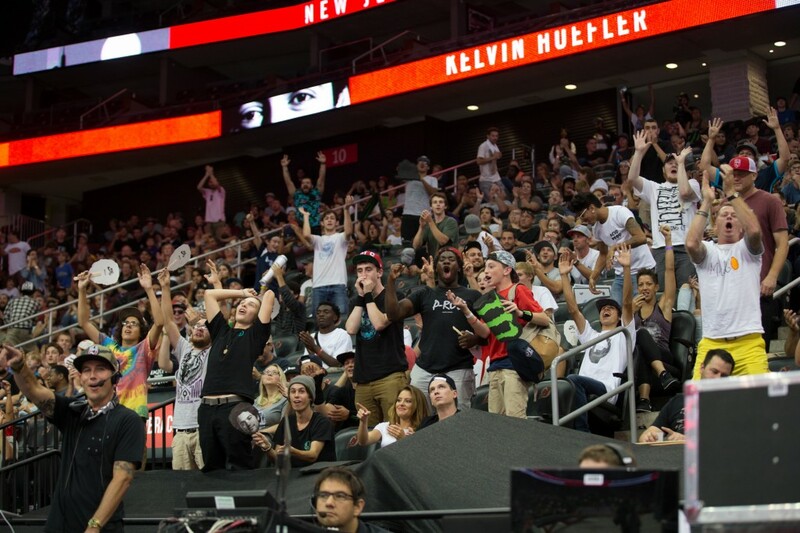 In a heated final that saw some of the most intense competition of the season, Nike SB Pro Luan Oliveira finally rolled away in first place ahead of reigning World Champion Nyjah Huston and SLS Rookie Kelvin Hoefler. With four SLS Rookies introduced into the roster this year, the season has become more unpredictable than ever. 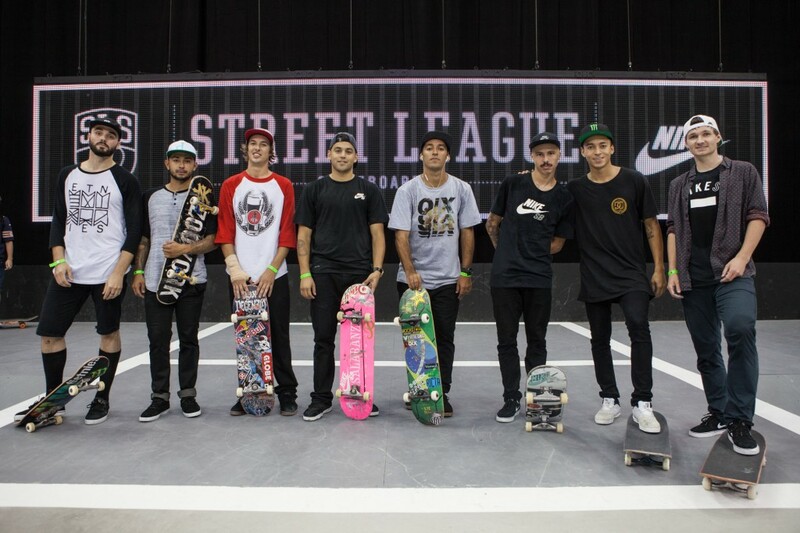 In order of Season Standings based off of cumulative Championship points, the Top Eight heading to the SLS Nike SB Super Crown World Championship in Chicago are Luan Oliveira, Nyjah Huston, Kelvin Hoefler, Chaz Ortiz, Paul Rodriguez, Shane O’Neill, Cody McEntire and Chris Cole. An exciting evening in New Jersey as Luan Oliveira hit ’em with the Back To Back. If Luan keeps this pace he might earn himself an SLS Nike SB Super Crown World Championship. Check out these key moments that got Luan the win.